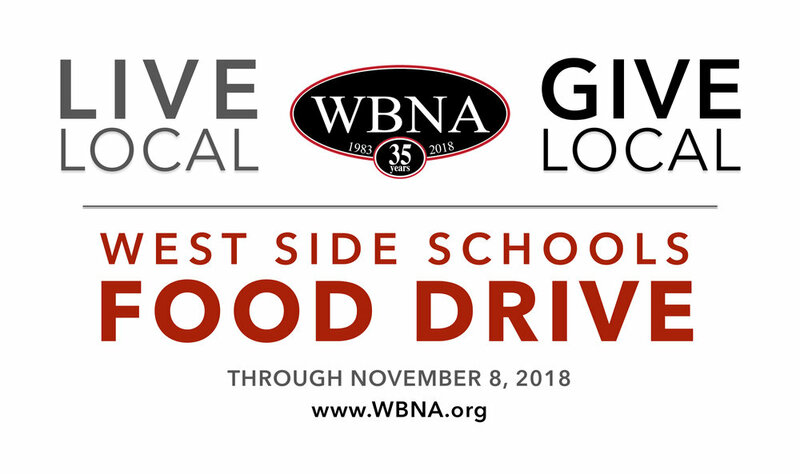 Join WBNA, the West Side Kids Committee, and West Side Play Space in supporting our 3rd annual community-led food drive to help families in need at Asa Messer Elementary, Carl Lauro Elementary and West Broadway Middle Schools. This drive helps fill Holiday Food Baskets distributed to families before the Thanksgiving holiday, and is the first giving event of our Live Local, Give Local neighborhood giving campaign. Donations of new canned and boxed food items can be dropped off now through November 8 at WBNA Headquarters (M-Th), and at our neighborhood donation bin locations at Seven Stars Bakery (Broadway), Sin, Schastea, RIMoSA, and Asthenis Pharmacy. We are also collecting $20 gift cards (easily donate one online) to nearby grocery stores that will be included in Holiday Food Baskets. Please help us achieve our goal of collecting at least 80 individual $20 gift cards by donating a gift card now! Donate new, unopened canned and boxed food items (see suggested donations list below). Donate individual $20 gift cards to nearby grocery stores or donate online now and we'll get them for you! Drop off food items and gift cards at 1560 Westminster Street (WBNA Headquarters) between 8:30am and 5pm, Monday through Thursday, until November 14. Gift cards can be purchased online through Friday, November 16. Please also consider donating to our Coat Drive for BND Coat Exchange and to the West End Community Center Holiday Toy Drive as part of our Live Local, Give Local neighborhood giving campaign. All donations can dropped off Monday through Thursday at WBNA, 1560 Westminster Street. Thank you for your kindness!